Well, some of you noticed that I missed my column last week, but that was only because I was so busy getting my 2014 Year in Review ready, and believe me, it’s not easy to wrap up an entire year of comedy in one sentence. Any time you try to make a list of the “top” anything, it’s always a little bit subjective, due to the point of view of the writer. 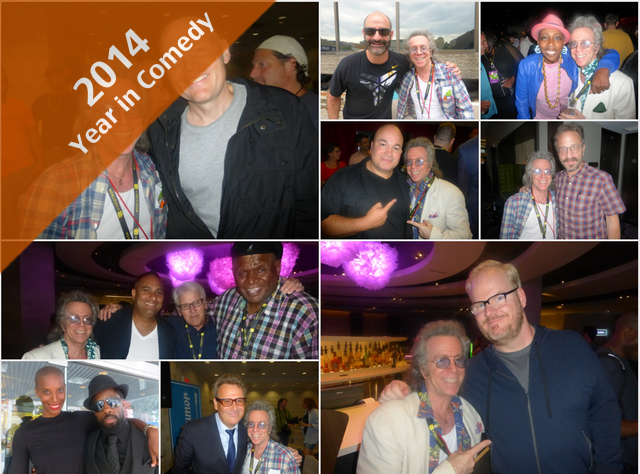 With the understanding that it’s not an exact science, and really just an opinion, I will give you my top 15 comedy events list of 2014, of all the events that I covered during the year. Some of the events I was involved with in some way, but most of them not! I tried to be as impartial as I could. 1. Bill Burr’s 2nd Annual Tribute to Patrice O’Neal. This one is special for many reasons. It shows the comedy community as a caring community. Stand up comedy is mostly a solo thing. For the most part you write alone and perform alone. But the stress of this creates an unbreakable bond for comics who respect each other’s comedic sensibilities, and talent. In this case the fact that Patrice O’Neal’s friends come together annually under the “leadership” of Bill Burr,who organizes the event and comes in from LA to bring it to life at The City Center with Patrice’s friends and colleagues like Opie and Anthony, Jim Norton, Rich Vos, Dave Attell, Dane Cook, Big Jay Oakerson, Harris Stanton who performed with Patrice on the last special he did– Elephant In The Room — down at The Skirball Center, Keith Robinson, Colin Quinn, Nick DiPaolo, and Robert Kelly, basically all the guys from Tough Crowd. It was even more special seeing Patrice’s mother and Patrice’s wife Vondecarlo, both sharing the joy of seeing Patrice remembered in that way. It shows great respect for a very special guy who I was privileged to know and love. I considered him a comedy philosopher, and he considered me a co-host of The Black Phillip Show, a radio show which changed the lives of many guys, and has loyal listeners to this day. Bill recently announced the 3rd annual Patrice Tribute Show coming up in February. 2. South Beach Comedy Festival. South Beach was special for several reasons. This coming year will be the 10th year for this festival created by Aubrey Kessler and though it’s a lot smaller than JFL or NYCF, it brings in the big talent. Aubrey works very hard on that and this past year it was Mike Epps, (who was soon after cast to play Richard Pryor in the new Lee Daniels biopic) with his After Dark tour, Nick Swardson, and Chelsea Handler with her Uganda Be Kidding Me tour during which she flashed photos of herself naked. That alone was worth the trip to Miami! (LOL) And how bad is it having to hang out in South Beach for a few days enjoying shows with W. Kamau Bell, Chris Hardwick who did live editions of @Midnight with Arden Myrin and Matt Braunger among others, and a killer show from Joe Rogan, and then we all got to hang out at the big festival party at one of the beautiful Miami hotels. For me personally it was amazing because I was one of the few people shooting videos and because I was given unrestricted access. I got interviews with everyone for my Comedy Matters TV channel, plus it was the first time I did daily call-ins to the Ron and Fez Show on SiriusXM, which made it all the more special. 3. Two Jerry Lewis events both involving The Friars Club. There are very few comedy legends left from what is known as The Golden Age of Comedy and any time I get the opportunity to be with one it feels very special. Jerry Lewis may be a controversial name to some people, but no matter what, you have to respect his comedy history and his contribution to American comedy. So the first event was the 50th anniversary party for The Nutty Professor which was honored by a Blu-Ray release of the film, and a huge party at The Friars Club. The second event a little bit later in the year in September was the renaming of the Friars monastery in honor of Jerry, which was attended by Lisa Lampanelli, Bill Boggs, Stevie Van Zandt, Vincent Pastore, Joe Franklin, Richard Johnson from the NY Post, Jackie Martling, Gilbert Gottfried, Pat Cooper, and Al Roker to name a few and Lisa Lampanelli and Al came out dressed as construction workers to give Jerry the first star that would be implanted into the sidewalk, commemorating the occasion. Special for me because I had the honor of writing for Jerry back in 1986 when he was roasted by The Friars Club, and I got to work with him for two nights in a row, just the two of us in his hotel room at the Waldorf Towers. Also special for me because Lisa Lampanelli and I went together. 4. The Del Close Marathon. Any time I get to see Amy Poehler perform it’s always a treat. As one of the founders of UCB, the feeding ground for a lot of our popular TV shows, she and UCB honor Del Close the famed improv teacher from Chicago’s Second City, many of whose students went on to be stars on SNL. For the past 16 years UCB puts on the Del Close Marathon which runs for a week-end and started in 1999, the year he passed away. I attended the Nick Kroll and Friends show at the Haft Auditorium at F.I.T. and got to see some of my favorite stars improv with Nick and each other, like John Mulaney, Amy Poehler, Maya Rudolph, Natasha Lyonne, and Jason Mantzoukas. It was a rare opportunity to see such talent having so much fun by playing with each other. Special personally for me since I got to do Kroll Show three times in scenes with Nick Kroll, John Mulaney, Amy Poehler, Laura Dern, and Katy Perry, and after the show we all got to hang out and have some laughs. Plus my Too Much Tuna sketch with Nick and John went viral. And so in every single promo I do on SiriusXM I end it with “Shout out to Nick Kroll”. He’s one of the most talented guys in the game, and loved by all who know him. 5. Just for Laughs Festival in Montreal. No list of comedy events would be complete without JFL in Montreal. Started in 1983 as a two day event by Gilbert Rozon, it became a month long event when Andy Nulman joined on in 1985, and so it’s 32 years and going strong for this mighty festival, the biggest comedy festival in the world. It takes over the whole city for the month, with the first two weeks in French, and the last two weeks in English. I go up for the last four days, which is when the televised galas happen with hosts like Jim Gaffigan, George Wallace, Russell Peters, T.J. Miller, Lewis Black, and even Don Rickles. 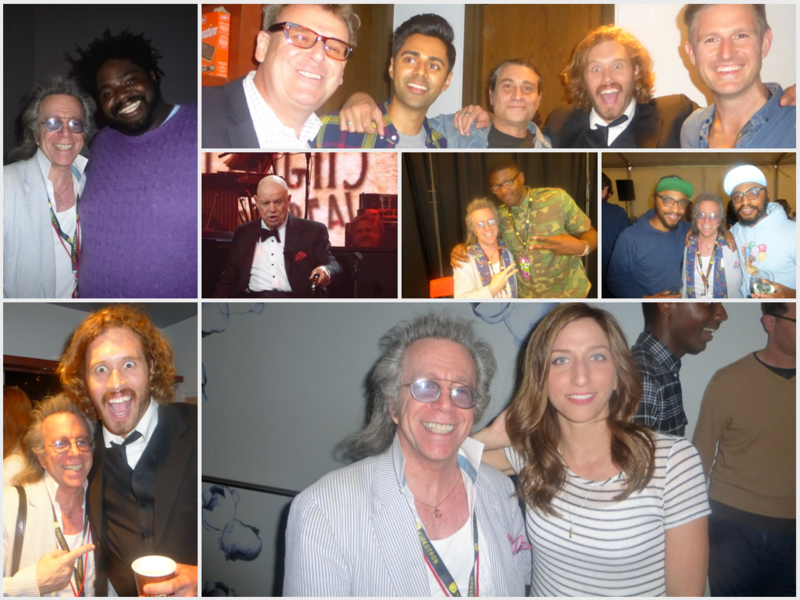 There were too many shows to list, but some of the highlights were Jim Norton’s Keynote speech, Andy Kindler’s State of the Industry address, Marc Maron’s WTF taping, Paul Provenza’s Green Room show, with comics like Greg Proops, T.J. Miller and Hasan Minhaj before he got The Daily Show. Then there was the red carpet for the Comedy Awards Luncheon, where Pete Holmes was the MC, and where Seth Rogen and Evan Goldberg received the award for Best Directors for The Interview, a movie that had not even come out yet and has been causing quite an international stir, in case you haven’t been awake for the last few weeks. Also on the red carpet was Bill Burr who received the award for Stand Up Comedian of the Year. Andy Samberg was there with the whole cast of Brooklyn Nine-Nine, the show that won for Best Break-Out Comedy Show. It was Chelsea Peretti, Andre Braugher, Terry Crews, Joe LoTruglio, and co-creator Michael Schur who won for Comedy Writer of the Year. In the video I did with Bill Burr I embarrassed myself by insisting he had played a cop in Breaking Bad to the point where he started wondering whether he actually did. Then he laughingly told me to do my homework next time. Thank goodness we’re old enough friends that he didn’t hold it against me! Even his publicist Michael O’Brien, who overheard the whole exchange had to laugh at that one cause I’m usually spot on with my facts. It was a special festival for me personally as I got to attend the premiere of a film I co-produced with Letterbox Pictures called Eat, Drink, and Laugh on the history of The Comic Strip. I was there with owner/founder of The Strip, Richie Tienken and the film was the sister project to the book we wrote called Make ‘Em Laugh that had an intro by Chris Rock, and interviews with Seinfeld, Ray Romano, Colin Quinn, Lisa Lampanelli, Susie Essman, Billy Crystal and about 40 others. Paul Provenza, came with Robert Wuhl, George Wallace and Judy Gold to attend the Q&A after the film. And then there was the Variety party for the Top Ten Comics to Watch, which included The Lucas Brothers, who counted as one comic, Pete Davidson and Monroe Martin, from Last Comic Standing. I probably shot 35-40 interviews while I was there for my channel and again called into The Ron and Fez Show every day to do an on air report. 6. New York’s Funniest Reporter Show. If this show wasn’t memorable it wouldn’t be going on for 9 years. Produced by the PR team of Goldman/McCormick and taking place at The Comic Strip, it shows that the people we watch every day bringing us the news, have a sense of humor too and are not afraid to get out there and possibly humiliate themselves in front of a packed crowd, because comedy is the hardest thing in the world to do, and they know it. So members of the national media like Greg Kelly, Magee Hickey and Brooke Baldwin the beauty from CNN put their lives on the line, and take the stage to do 5 minutes of material after working with comedy mentors to prepare. My personal connection is that I was a mentor, and for the first time my mentee won. Brooke Baldwin anchor of CNN, won the title of New York’s Funniest Reporter. She worked really hard and definitely deserved the honor. 7. The Andy Kaufman Awards. This was the 10th year of the Andy Kaufman Awards, and the 30th year since Andy left us. It was the year that Bob Zmuda came out with the book stating that Andy is still alive and has been in hiding for the last 30 years in the greatest hoax of all time. Michael Kaufman, Andy’s brother who produced the award show is not exactly a big fan of Zmuda’s theory, and the event took place at UCBeast with T.J. Miller as the perfect host. He totally embodies Andy as far as I’m concerned, but no one really knows how far that is. Last year’s winner Harry Terjanian participated and past winner Nick Vatterott made a surprise appearance and created even more of a surprise by suddenly running out and wrestling T.J. Miller to the ground, while I was backstage watching. 8. The Keith Robinson special produced by Kevin Hart. I’ve been to many specials but this one was different because of who was involved and what they said. Kevin Hart is HUGE! He seems to be in every movie ever made, so for him to produce this event and not only come and make an appearance, but to make a speech crediting Keith Robinson with his success really says a lot about Keith, and about Kevin as well. It was at The Gramercy Theatre, and I got there kind of early and read the paper waiting for everyone else to arrive, so I didn’t see Colin Quinn surreptitiously take my photo on his cell phone, while I was reading the paper, and Tweet it out to The Universe. The whole Tough Crowd crowd showed up to support, along with Chris Rock, Gary Gulman, Sherrod Small, Zainab Johnson, and tons of other comics, plus Patrice O’Neal‘s mom and his wife Vondecarlo, and the after party downstairs in the theatre was as much fun as the show cause it was cool to see Chris Rock laughing with Kevin Hart and Keith, and reminiscing about all the fun times they had together. For me personally it was great to re-connect with Kevin who I had produced back in 2010 in a benefit for Haiti out in Westbury. Tony Rock was the feature, and Wil Sylvince was the MC, and 3,000 people showed up to laugh, and support. Colin Quinn and his family idolized George Carlin, who actually attended Colin’s first Broadway show An Irish Wake. Colin’s entire family showed up to meet George and so it was no suprise that Colin was asked to host the ceremony naming the street where George grew up on the Upper West Side as George Carlin Way. That same evening, there was a great show at Carolines honoring the naming and Colin hosted that too. It was a great outpouring of affection for George, and his daughter Kelly Carlin was there and was one of the organizers of the event. SiriusXM came in to film it for a future showing, and Rick Overton flew in from LA just to participate. Big names showed up to perform like Dave Attell, Jim Norton, Judah Friedlander, and Artie Lange. When I got there I ran into Eddie Brill outside with Rain Pryor and both of them performed as well, along with Ted Alexandro, but I think all would agree that the highlight was Gilbert Gottfried who killed and shocked the crowd by saying how glad he was that George Carlin was dead, and he could only have been happier if he could have killed him himself. Then he could tell his grandchildren that he killed George Carlin and he could tell them in Yiddish which he attempted to do. Even Kelly Carlin, George’s daughter was hysterical laughing along with everyone else because only Gilbert could say anything like that and make it funny. This event was a one-of-a-kind and belongs on the list. 10. New York Comedy Festival. 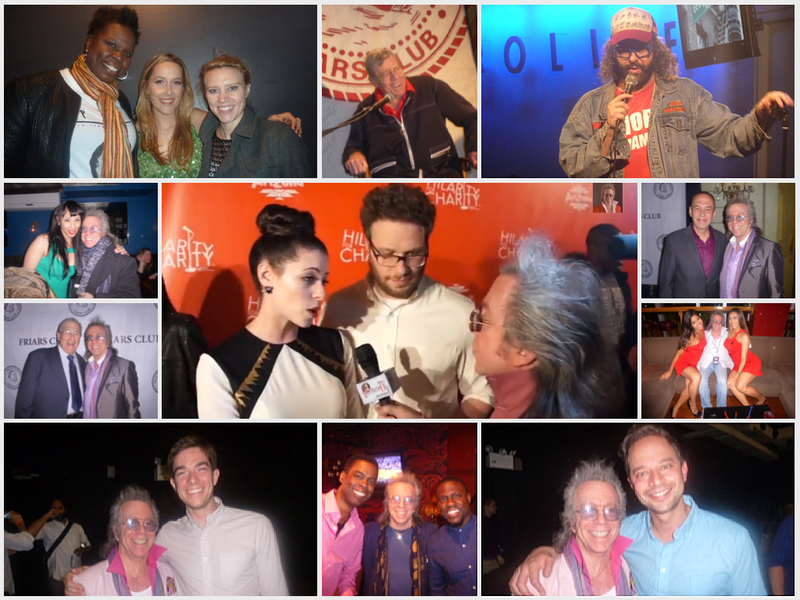 Only Caroline Hirsch, the Queen of Comedy could bring together this many big stars and this many big venues. Let me sum it up by mentioning the one show that really blew me away, a private show for the NRDC at an event space on Park Avenue, co-chaired by Lorne Michaels and David Steinberg with Seth Meyers as the host, featuring Larry David for his first stand-up performance in over 30 years, Jerry Seinfeld, Susie Essman, and Amy Schumer. This was going on at the same time as Stand-Up For Heroes at The Beacon Theatre honoring our Wounded Warriors starring Bruce Springsteen, Jim Gaffigan, John Oliver and Jon Stewart. Only Caroline Hirsch can pull that off, and does every year. The festival kicked off with Dave Attell’s Comedy Underground show at Noam Dworman’s Village Underground which has become part of The Comedy Cellar, the club where every big comedy star aspires to perform. It’s a right of passage. This night on Dave Attell’s show it was Jessica Kirson, Gilbert Gottfried, Big Jay Oakerson and Kurt Metzger. Other highlights for me during the festival were Chris Hardwick doing live versions of @Midnight, Hersterical , the all women’s show produced by Cristina Cote at Carolines with Kate McKinnon and Leslie Jones from SNL plus Sabrina Jalees, Aparna Nancherla, Helen Hong, and Bonnie McFarlane. I went to see Amy Schumer playing Carnegie Hall, and it was exciting for me just seeing her up there, then there was Big Jay Oakerson’s party at The Stand, Roast Battle at The Gramercy Theatre, and Nick Vatterott’s CD release party at The Stand. I also caught Ha! The Musical at Rick Newman’s Stage 72 Theatre, which was a really fun show. And on a personal note I was the only outside video person filming interviews at the Larry David event, and wound up with some very memorable footage. I also called in daily reports on air to Ron and Fez. 11. The NYCF Opening Party. I list this separately from the festival as it deserves its own mention. Not everyone got to go, and it was like a little JFL festival in one huge room of The Empire Hotel, with fun food and fun music even though most comics are not big dancers. There were hundreds of comedy people eating sliders and fries with an open bar that was greatly appreciated. Jessica Williams made a surprise visit with her waist-length dreads, Jeffrey Ross popped by to party, Nate Bargazte who had just taped his own Comedy Central special with Luis J. Gomez, arrived to a big greeting from Comedy Central execs, Hasan Minhaj, who had just moved here from LA to be part of The Daily Show was there, the cast of Ha! The Musical, and when I left around 3 A.M. I had Yannis Pappas, Paul Virzi and Comedy Central executive JoAnn Grigioni in my car! To see more about the party just read the column! 12. Gotham Comedy Live Tapings. 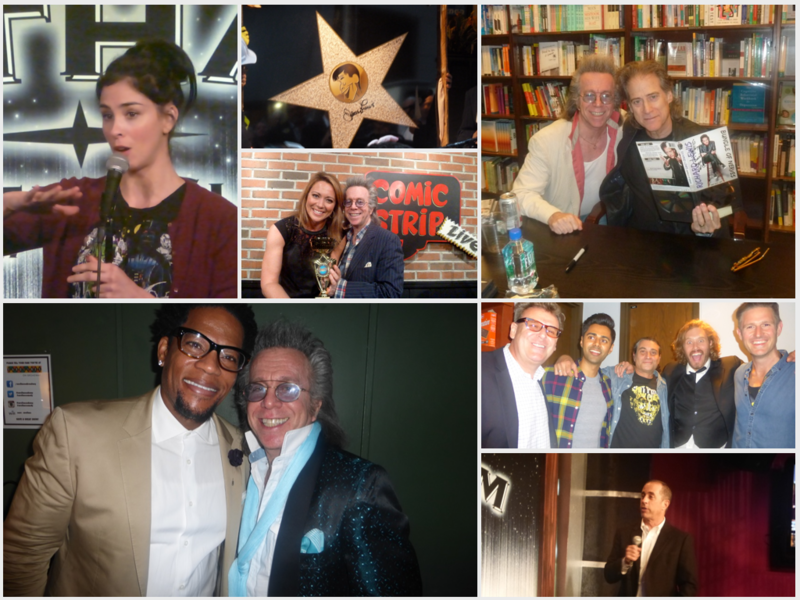 For most of the year I spent Thursday nights at the AXS TV tapings for Gotham Comedy Live where they got great hosts like Mick Foley, Jamie Kennedy, Anthony Anderson, Carlos Mencia, Steve Schirippa, Tommy Davidson, Louie Anderson,Bobcat Goldthwait, Joe Piscopo, Gabe Kaplan, Tommy Chong, Trevor Noah, and so many more. But it was the after-parties downstairs with owner Chris Mazzilli, and the producers from Killer Bunny Entertainment, Dave Goldberg and Rob Cea that made it even more special. They start up again on Jan. 15th with Sinbad as the first host to kick off the new season. 13. Mike Epps at The Theatre at MSG and again at Westbury. Mike Epps is a force in comedy and one of the nicest and coolest guys on the scene. It’s no surprise that Lee Daniels chose him to play Richard Pryor in the upcoming biopic, announced by none other than Oprah herself. Mike refers to Richard as “The King”, and says that any Black comic that wasn’t influenced by Richard wasn’t paying attention. Richard was “the blueprint.” Along with the funny, Mike brings excitement to the stage with his style and charm, and for me personally it was special as I got to go over to MSG with him, just us in his car. I was hanging out at the house when he called me and asked me what I was doing. When I said I was just hanging out he said, “How’d you like to come with me to MSG to my show tonight?” Needless to say, I went and it was a blast. Same thing at Westbury this past month when he had a sold-out show for his After Dark tour. This definitely belongs on the list. 14. Russell Peters at MSG. Only a handful of comics have ever been able to fill arenas. Especially one with 20,000 seats. Russell Peters can and did. I call him “The Messiah of Comedy” because he shows comedy to be a true healing force. His audience is multi-ethnic, multi-national and he makes everyone laugh at themselves and at each other. It’s a sight to behold. With one or two hip-hop DJ’s opening the show for him, it’s an entertainment extravaganza. Opening for him was Zainab Johnson, Gregg Rogell, and Roseanne, and Russell brought the heat. There’s a reason that Russell pulls in $21 million a year. That’s sick money, and the after-party at The DL was even sicker! His show belongs on this list. 15. The Unmasked Series of Interviews by Ron Bennington. Ron Bennington has done an unbelievable amount of one hour in-depth interviews in the past year alone. In one recent week he did three, starting with The Farrelly Brothers, then Ron White and then an incredible one with Andrew Dice Clay during which Dice was moved to tears. A couple of the other really special ones were with Tracy Morgan and Joan Rivers. And Ron never uses notes. It’s just a one hour in depth conversation which only he can do. I was privileged to be part of Ron’s other show this year, The Ron and Fez Show, and brought many friends with me, including Colin Quinn, Artie Lange, Russell Peters, Lisa Lampanelli, Susie Essman, Larry Miller, Shecky Greene, Joe Piscopo, Paul Provenza and Rick Newman to name a few. 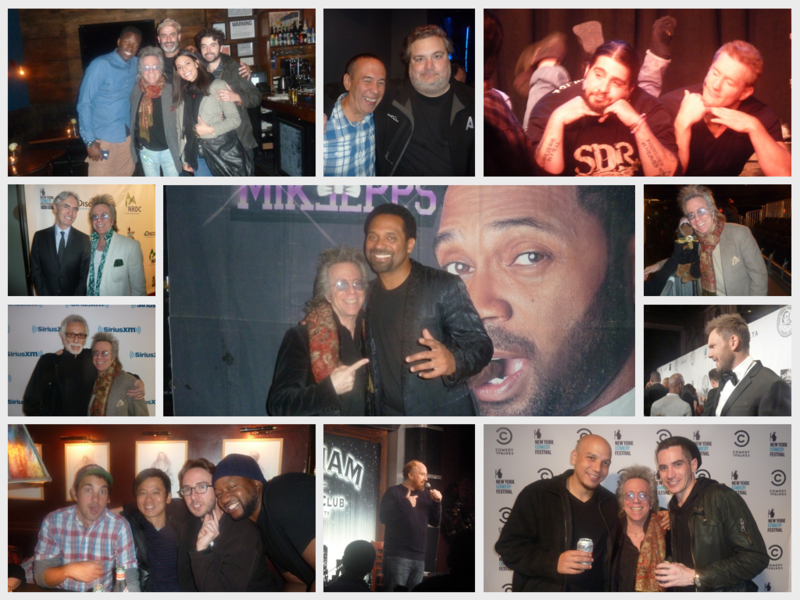 So all in all, it was an amazing year in comedy, and that’s my list of the 15 best events I covered, but it wouldn’t be complete without a special year-end shout out to all my comedy club people who make me feel welcome every time I show up, like Chris and Steve Mazzilli at Gotham and that whole Gotham crew, Louis Faranda, Greg Charles, and Caroline Hirsch of Carolines on Broadway, Richie Tienken, and Tom-E at The Strip, Noam Dworman, Steve Fabricant, Estee and Val down at The Comedy Cellar, Gabe Waldman, J.R. Ravitz and Greg Judge over at Stand-Up New York, and Chris and Paul Italia and Patrick Milligan the Cringe Humor guys at The Stand. Thank you to all, Happy and Healthy Holidays, and Happy New Year to them and to you guys who read The Interrobang! One last thing before I go – you may notice that I didn’t mention the Tracy Morgan accident and the passing of Sid Caesar, Robin Williams and Joan Rivers. 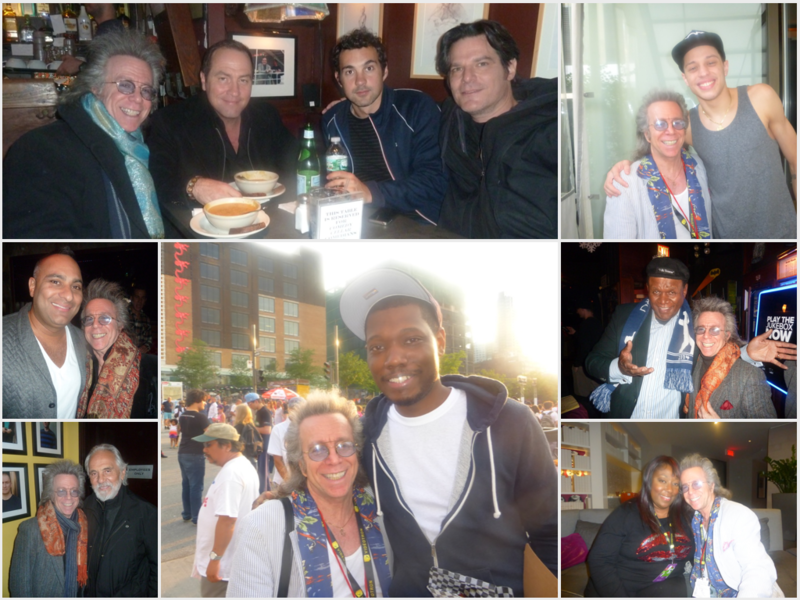 All were certainly memorable events, that deeply affected the comedy world and the world at large, but I limited my list to strictly entertainment events. 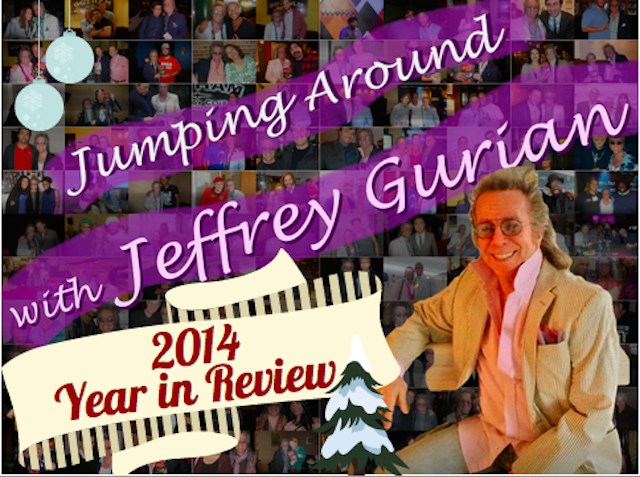 See you in 2015 with more “Jumping Around with Jeffrey Gurian! And please go to my Comedy Matters TV channel and subscribe to see all the fun videos I’ve mentioned and lots more!